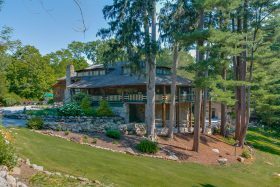 Originally built in 1904, “Orient Lodge” is a restored Arts and Crafts compound on Saw Mill Pond that looks like it belongs on an Adirondack lake. The original 40-acre lot housed a saw and grist mill, dating from 1825. Legend has it that the owner cut down chestnut trees on the site to build the house. The lot has since been reduced to just over two acres but it still has an estate feel and is now up for sale asking $1,950,000 (h/t CIRCA). Not only will that get you the three-story main house–which has been fittingly outfitted with historic Asian features–but a detached two-car garage with deck, a separate cottage, and the original landscaping.